We modelers really have an easy time of it these days if there is a much stronger desire to fly than to build, or if there is an innate inability to build well. 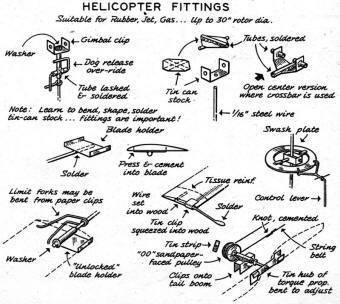 Levels of engineering and prefabrication have reached the point that even with vehicles as complex and inherently unstable as helicopters and multirotor platforms, a model pilot wannabe can purchase just about any flying platform in a ready-to-fly configuration. 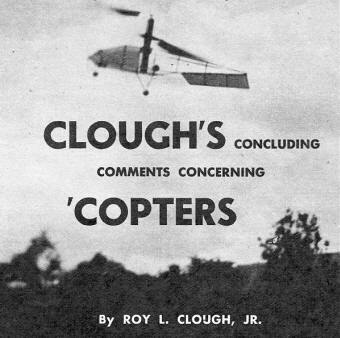 Not many people back in the era when Roy Clough wrote this article even dreamed that for a couple hundred bucks it would be possible to buy a helicopter that would be able fly in a hands-off manner, but would even have an onboard computer that would bring the craft back to an upright, stable, hovering state simply by pushing a literal panic button on a transmitter. 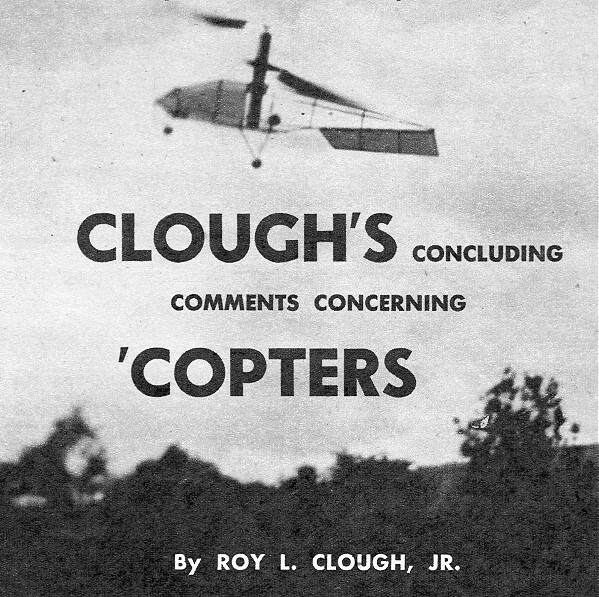 By Roy L. Clough, Jr.
With full-size "choppers" more and more in the news this informative series will get you started off on the right foot in building your own model helicopter. Once the reader has flown a rubber job successfully and wants to build a model capable of really big performance, it will be necessary to switch to gas engine or jet power. 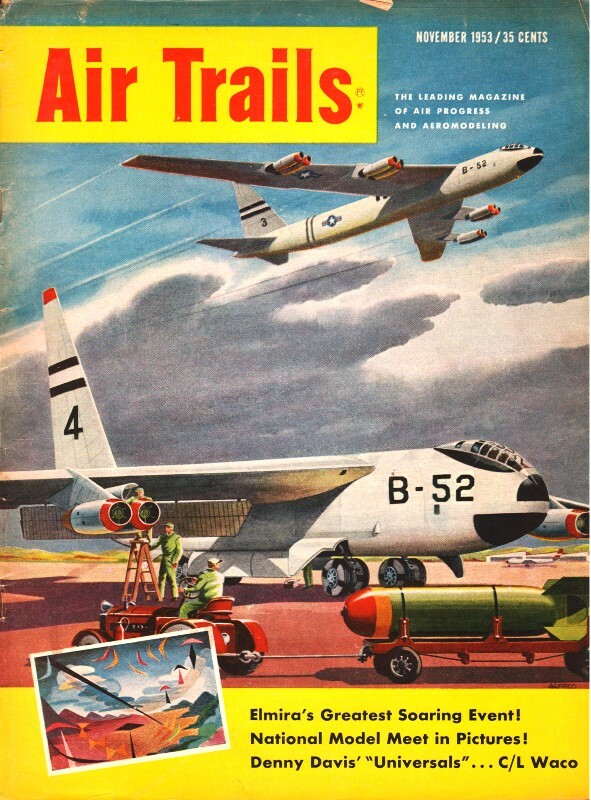 Let's deal with jets first. The Jetex motor is an excellent source of power for model helicopters; generally speaking two will be used, although it might prove practical to use up. to four, although this complicates the problem or getting a number of motors ignited at the same time in order that the charges burn evenly to preserve the balance of the rotor. For that matter a one-bladed rotor, with the blade balanced by the motor, can be used very successfully - which I know sounds a bit contradictory, but the practical fact is that the burning charge getting out of balance in a one-bladed system is considerably less critical than, say, two or three charges consuming at an uneven rate in a multi-blade system. The reason for this seems to be that the thrust output of the Jetex varies according to the amount of fuel left at any given instant, and peaks at the last few seconds. Thus in a multi-bladed system we have several thrust peaks, and if they do not closely approximate each other the thrust load on each blade may vary widely; meaning considerable pitch variations in a dynamic pitch rotor. In a one-bladed, single-motor job, the thrust variation is inherently "in gear" with the single rotor blade. Unbalanced centrifugal loads due to fuel charge consumption result in a narrow period of oscillation of the rotor mast, but since this vibration lies in a spanwise plane the practical effect is not serious - for a model. 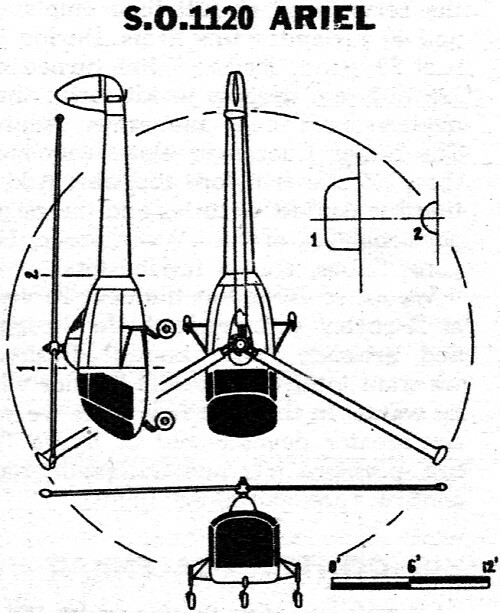 The "jets replace the dynamic weights of the unlocked type rotor, being mounted below and ahead of the rotor tips. The angle of thrust should be slightly downward, and it may be necessary to provide up-pitch limit stops to facilitate getting the rotor going. 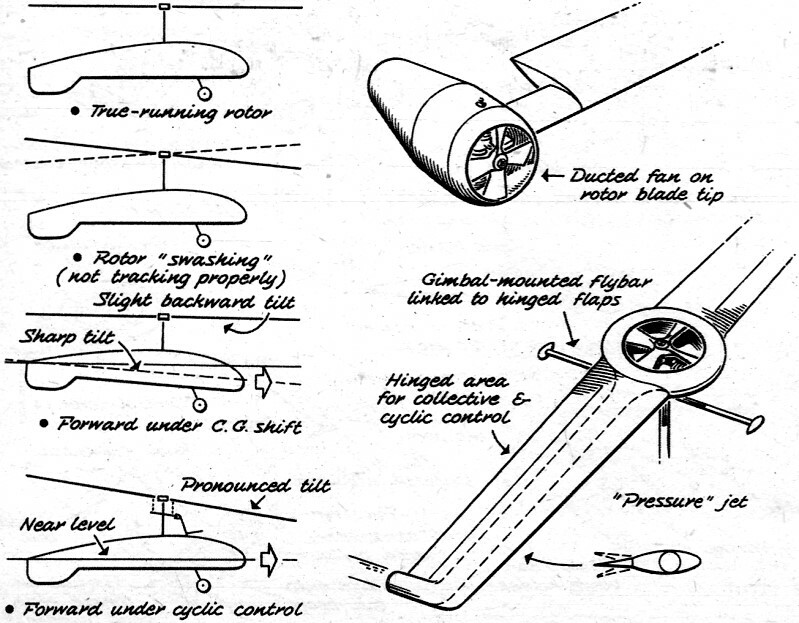 The balance of the rotor blade on its pivot' should be slightly nose heavy with fuel charge aboard. Note this, because of the position and forces exerted in this type. of rotor it is not necessary to use stable blade sections - use the highest lift cambered section you deem practical and don't worry about pitching moments; the orbiting of the tip weight clamps the blade firmly at - whatever pitch the speed and dynamic settings call for, and transition into auto-rotation after burnout is smooth and easy with a good let-down. The adapting of a tiny internal combustion engine that screams out its very high power rating at speeds in excess of 10,000 rpm to rotors which run under 2,000 rpm, offers an interesting challenge. This may be achieved in a number of ways. The classical method is to reduce the speed and increase the torque through reduction gears. These should be of at least 5-1 ratio and there must be some sort of clutching arrangement between the gears and the rotor, otherwise it may prove to be impossible to start the motor, or gear teeth will be stripped by the high starting loads. 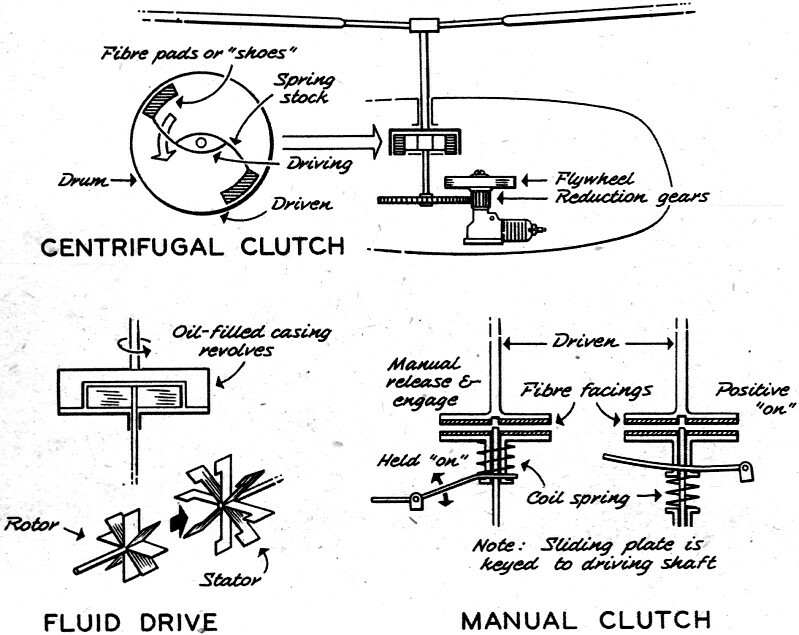 A clutch satisfactory for this purpose should engage smoothly and positively, and may be either of the manual engaging type, in which the release of a lever holding two faces apart permits them to be forced together under spring compression, or of the centrifugal type which engages automatically with an increase in speed. See center sketch on this page. Clutches require access to tools and a knowledge of machining operations, but this should not deter a really determined builder. The ideal thing, of course, will be for some heli manufacturer to read this and produce a small light weight clutch-reduction-gear unit at a reasonable price. Experience in the model race-car field indicates this can be done. Reduction can be had by means of pulleys and belts, with a sliding engine mount serving as a "clutch," but belting is not the most satisfactory power transmission. I have flown a K&B .049 job with belt reduction, briefly. The belt begins to slip after a time and the model descends. For this job I used, a round belt running over wood pulleys at 4.5-1 with a heavy application of a good belt dressing. The problem seems to be that the high speed of the engine pulley soon glazes the belt, causing excessive slippage. Howard G. McEntee has suggested using small Vee belts. This might work a lot better due to the better traction offered by such a belt, but obtaining Vee belts and pulleys small enough for the purpose has been a poser. When using belt drive with gas engines, great precautions must be taken to keep fuel spray off the belt and pulley. A baffle between the shaft and intake tube and exhaust ports is highly necessary, and frequent wiping of oozed oil from the end of the main bearing is a must. Another angle which I've been experimenting with lately is to use a torque converter between engine and rotor. A torque converter is simply a specialized type of fluid clutch and operates without any direct connection. I use a small high speed rotor connected directly to the engine shaft, running inside a larger rotor which is connected to the helicopter end. The casing is filled with castor oil. This device, in bench tests, appears to transmit a fair amount of power - with redesigning and a bit of finagling it should be quite efficient. However, I have had a lot of trouble due to overheating, which causes some of the oil to ooze out past the bearings, and that results in lowered efficiency of power transmitted. In any event power for the torque prop isn't hard to arrange. 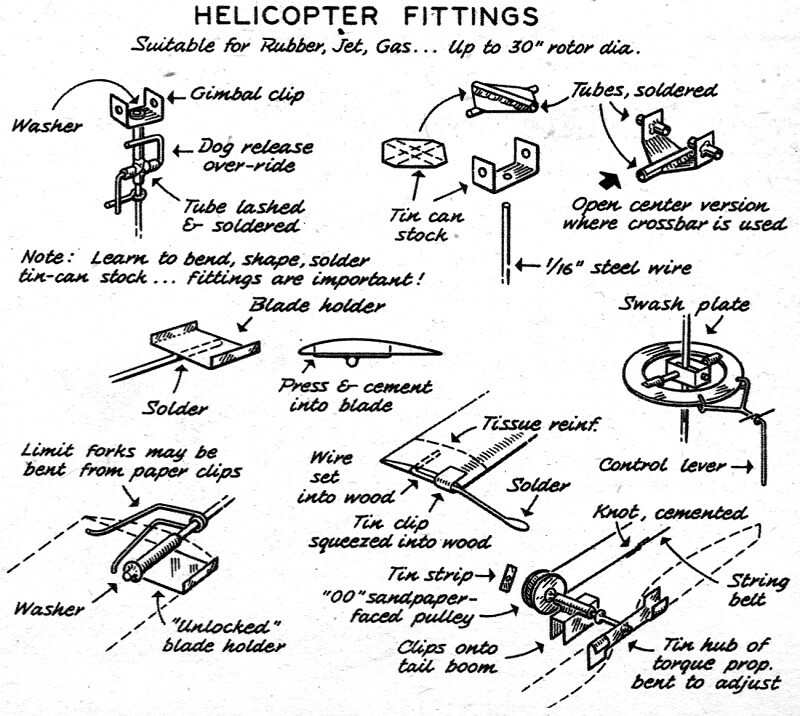 Turn this about two to three times as fast as the main rotor by means of a simple string belt running over sandpaper-faced pulleys. Remember that the torque prop should stop when the model goes into autorotation in order that it won't swing the tail around in a circle on the way down. 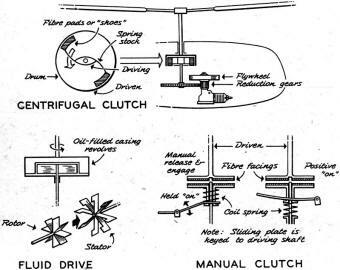 Simply attach the driving pulley between the clutch and the ride-out dog of the rotor. We mentioned this before, the rotor release. Whether or not you plan for autorotation you must have a rotor release which permits the rotor to override when the power quits. Otherwise the great amount of kinetic energy stored in the spinning rotor may twist off a shaft or strip gears or even shatter the blades if the system suddenly freezes when the motor stops. This unit can be incorporated in the function of the clutch or may be a separate item in the rotor hub; I prefer it to be separate since this simplifies the operation of stopping the torque prop when the motor quits. Now, how about really simple gas motor hook-ups. requiring no gears or clutches? Sure, it is possible and practical, and may be accomplished in several ways. One way is to use torque reaction drive such as in the little Infant powered job of the previous article. However, don't use the primitive semi-articulate rotor system of that model, but build your rotor along the lines discussed in the previous issue for the rubber coaxial job, except use unlocked blades on the big rotor to get a good auto-rotational descent, and locked, but feathering blades on the small rotor attached to the engine shaft, say in a rubber mount, to permit a small amount of see-saw action. 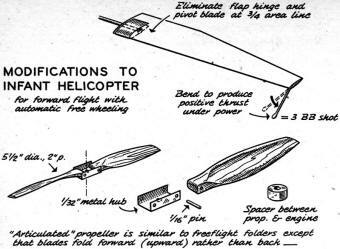 Because of the strong downwash of the small rotor a brake or fin is required to prevent fuselage rotation, but for simplicity this is hard to beat. Propelling the. rotors at the tips by means of propellers has been suggested many times by many people. It seems simple, but it can be very troublesome. 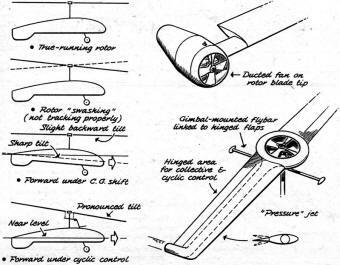 The reason is two-fold; First; the props act as gyros running in a tight circle - meaning the engine shaft tends to twist upward or downward, depending upon rotational direction of the blade to which it is affixed; second, torque effects may add a bit of complication. You can, however. 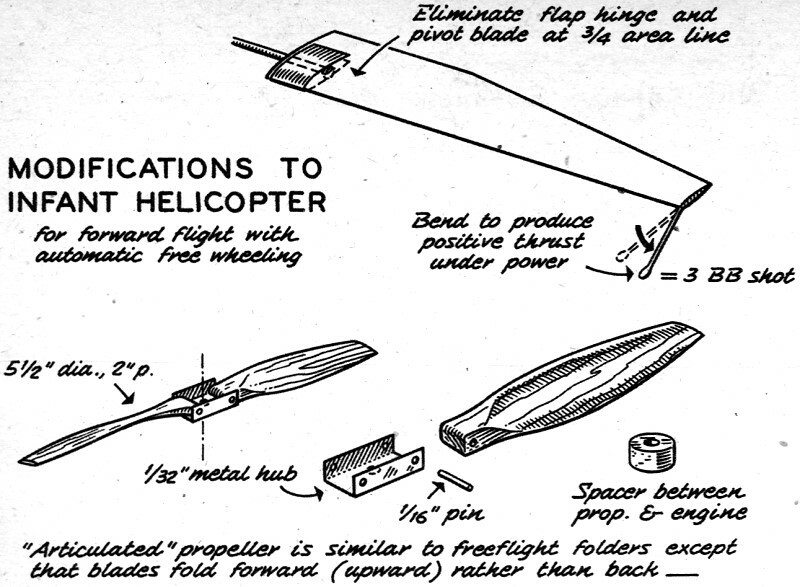 make such an arrangement work if you use my rotor configuration. the unlocked system. and playoff torque and gyro effects against centrifugal loads. Use very light driving props of as high a pitch and small a diameter as possible, and place the thrust line of the engine angled toward, or away from, the chord parallel, depending upon which way you run the rotor, to help compensate for gyroscopic twist.